Two years ago I was asked to decorate a tree in the theme of a wish – a wish from Lauren, who has Cystic Fibrosis and wanted to go to the Grammys. Not only was I honored to do so, but decorating that tree was so much fun. It’s not a secret around here that my love language is music. I decorated that tree in shades of pink, song notes and touches of gold. One of my favorite things I did on the tree was the tree skirt. The tree skirt included gold vinyl records. This is literally like the easiest tree skirt in the history of ever. If you’re a music lover like me, this might be something you’ll want to do this Christmas as well. Gold Spray Paint if you want gold records – my favorite gold spray paint is Design Masters Gold Medal. If you want to paint the records, go ahead and do that first. Let them fully dry overnight before attaching them to the tree skirt. The only reason I painted these was because it made them more Grammy like. I would love to do one of these around a Christmas tree in our Jungle Room at some point, but I think I’ll leave them as is. I think it would be fun to see all the artists and album titles. Lay your tree skirt out on the ground. Using hot glue, attach the records to the skirt, overlapping the records slightly as you go. 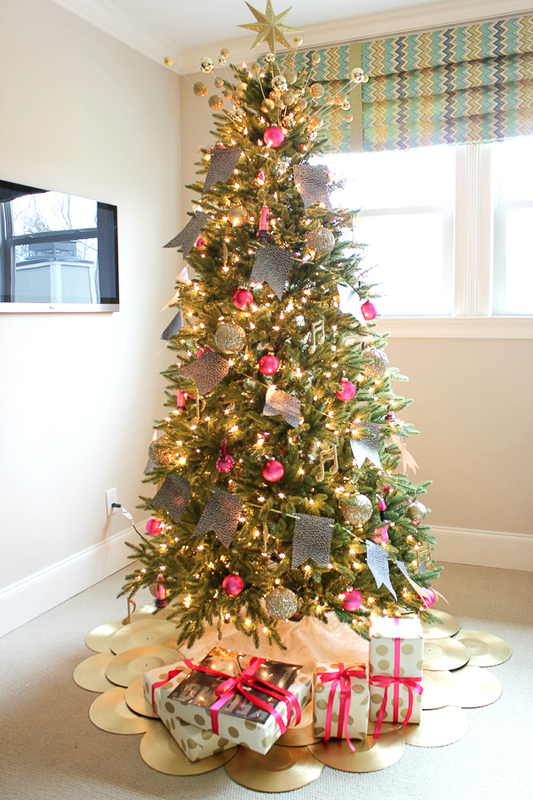 Wrap your tree skirt around your Christmas tree’s base as you normally would. Lay the records out on top of the tree skirt, overlapping as you go. With this one, I just laid the records on top of the tree skirt without attaching them with hot glue. The tree was being auctioned off, so I knew that the records might not be everyone’s pick and I wanted them to be able to just use the tree skirt without the records if they wanted to. You can see more of the Grammy tree here. Pretty easy, right? Now if I can just find more records for one of these bad boys in the Jungle Room. Oh i do love this tree, it is stunning. The record skirt is such a great idea too. That is truly creative and resourceful Jenna! Love it! I’m sure if you checked resale shops and garage sales you would find albums. Hubby and I still have our albums from high school days. Admittedly can’t give them up yet and not sure why when we don’t even have a phonograph! MERRY CHRISTMAS to you/family!! Thanks, Julie! I’m sure you’re right about finding them at the resale shops and garage sales. I haven’t had much time to look, but I’m going to make it a point to look for them in 2017 so I can be ready to make one next Christmas! My son is a musician, and, I think he would love this for the tree in his ‘man cave’. He owns hundreds of vinyls, so he could use his own, unpainted!!!! Love the idea! And, yours are beautiful!!!! Thanks, Sara! Yes, I really love the idea of doing the skirt with unpainted records too! And it’s so easy! I wish I lived closer I have so many that I will never play again, and I would be glad to give them to you. That is such a cute idea. Thanks, Patty! I’m sure I’ll be able to find some around here, not this Christmas, but hopefully next! How creative! I would have never thought to do this!! We are big music people in our house, so this might be something we try in the future. Thanks for linking up with us at Share the Wealth Sunday! Thanks, Krystal! It was so easy! This is an awesome idea. My brother-in-law collects albums, and still plays them. I’ll be Pinning and sharing this tree skirt with his wife. 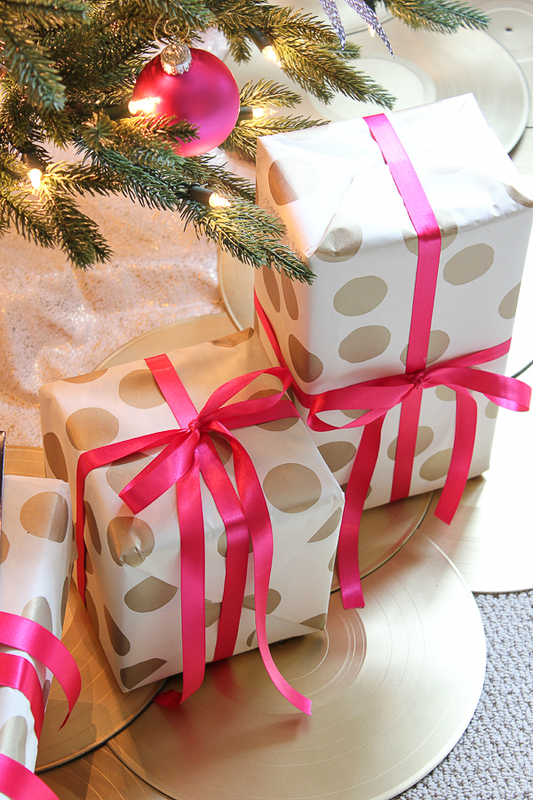 This would be great with a few old LPs gifts under the tree. Thanks for sharing on Sunday’s Best Linkup. Great, Rhonda! It’s so easy and fun! 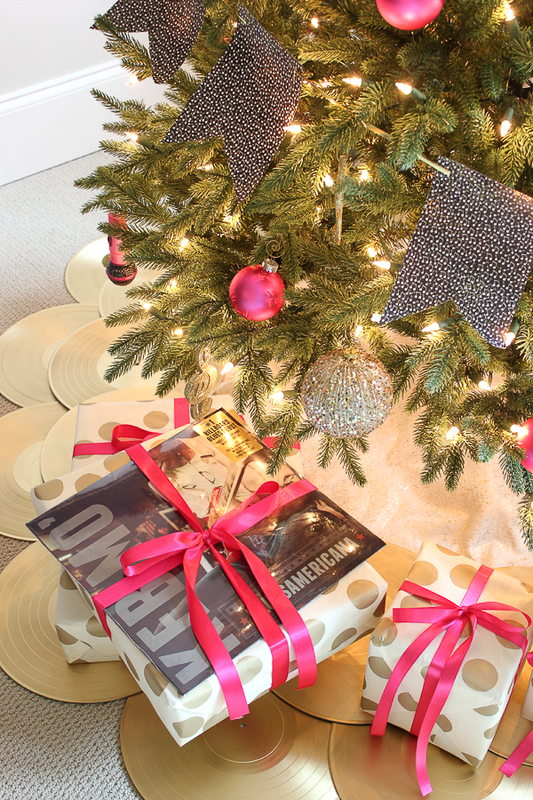 Leave it to you Jenna, clever and innovative idea, love how gold records look around and under tree. Did awesome job decorating and what an honor being selected to decorate it. Am sure whomever got tree was very pleased with it. Thank you, JaneEllen! It was such a simple little project and so much fun! I hope you have a wonderful Christmas as well! That is such a clever and cute idea! This is so fun! There are many musicians in my family that would love this idea. Merry Christmas!